By the time Tropical Storm Isaac hits Haiti, it is forecast to be at hurricane strength. CNN is reporting that there are NO signs of hurricane preparations in Haiti. Hurricane Isaac will bringing destructive wind and water, reports say. As much of 12 inches of rain is forecast for some parts of Haiti. CNN says Hurricane Isaac "threatens to unleash disaster once again on vulnerable and often unaware Haitians by Friday night." "These rains could cause life-threatening flash floods and mudslides," the National Hurricane Center in Miami said. Please, we need to move forward. Earthquakes and hurricanes are natural disasters. 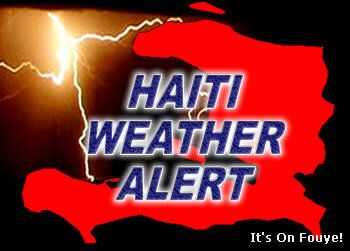 Stop associating natural disasters with acts of God to punish Haiti. Bondie pam nan ap proteje Haiti. li pap frape pa siklon isaac jan yo panse li a, se certain ke nou pa gin preparasyon sur le plan equippment ressources .mwen konen se yon ti peyi pov li ye. men Bondie se bouclier nou le se paravent nou e protection nou par excellence lap lonje de bra li bare tempet la e pote kalmi nan peyi a. paske li se yon Bondie ki pa fe kole fasil. li plus renmen ke li pini. lap beni Ayiti e lap beni pep li a li renmen anpil la. lap proteje ayiti.